More like RING MASTER, amirite? Welcome to another edition of Lesser-known Video Game Soundtracks. Today, we’ll take a look a soundtrack composed by Koichi Sugiyama’s orchestral arranger and published by a company known for a blue hedgeh— Sega. I don’t need to make it mysterious. This game is developed and published by Sega. 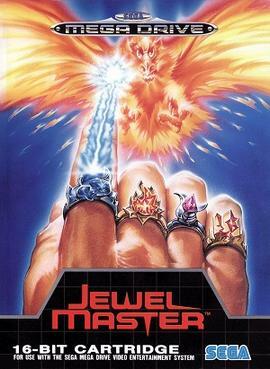 Jewel Master is an action-adventure game published by Sega in August of 1991. It released on August 30th in Japan and August 29th in the US. SO TAKE THAT JAPAN. SCORE ANOTHER ONE FOR THE USA. The score is like, 30-∞ but whatever, I’ll take whatever we can get! It also released in Europe in 1991. I cannot find an official date. If it says it released in 1991, that probably means, knowing Europe, they got it in 1994 or 1995… … … I kid I kid… I kid cause I love. Pretty epic. The gameplay is actually really fun. You go around collecting the rings. You can use the rings using the A and B buttons and the C button changes them. Enemies have specific weakness to certain rings, etc. Very enjoyable, especially for a game from 1991. But you’re here for the music, right? I love his work. Thoughtful and deliberate. Game Gear is TOUGH to write for! It’s 3 FIXED square channels (no duty cycles!) and a noise channel. He makes some really nice sounds though. That second track is from 1995, believe it or not. I can’t believe they were still making new Game Gear games that late. He also was the primary arranger for Koichi Sugiyama Game Music Works Collection: Melodies of Game Music. The collection features 2 CDs worth of works by Koichi Sugiyama. I spent some time searching for tracks from this collection but I can’t seem to find any. Oh well. I could listen to this on loop for hours. I sorta did while writing this. Hypnotic mixed meters and a great melody. He utilizes the drums very well too. Put this music into context- this is 1991. Not 1995. Not 1993. 1991. The Mega Drive/Genesis is still relatively young. This is great work. Mysterious and meandering but REAL. Then the organ kicks in and you’re like: oh. man. The use of classical conventions like suspensions and dissonance (he’s not afraid of dissonance at all) are perfect. Then he jumps into a wild flair of virtuostic organ badassery. That’s the technical music term. I had to look that up in Grove’s. SEE. IT’S TOTALLY IN THAR. I’m a 5 year old. Um. This is the best thing ever. Badass FM guitar and double kick. Again, this is 1991, folks. So. Awesome. Anyhow, here’s a full OST link so you can hear all that this soundtrack has to offer. Any favorite tracks? Leave comments! This entry was posted on Monday, September 30th, 2013 at 4:06 pm	and tagged with bgm, game music, gaming, Genesis, Jewel Master, Mega Drive, Motoaki Takenouchi, retro game music, Sega, video game music, video games and posted in Lesser-known Video Game Soundtracks. You can follow any responses to this entry through the RSS 2.0 feed. First thing I noticed about the organ piece was that it follows the Baroque style very closely (and correctly). It’s like a shortened Bach toccata or something. The FM guitar reminds me of so many Final Fantasy 6 battles. What a trip. Is it just me or is there some sort of LFO on the double-kick? I don’t know the capabilities of the system but I’m sure you’d know if it was possible to do that. Sounds rad to be sure. Not to mention there’s a motif that’s in all of the tracks. Really ties the soundtrack together! Definitely! I’m sure it will be great! once again a great blog-article, awesome! !